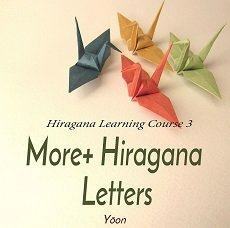 In this lesson, we will learn some more Hiragana letters, called yōon. Yōon is that one い-sound Hiragana letter and one small や, ゆ or よletter join together and represent one sound. You can download the PDF “Printable Yōon Hiragana Table”. At the first row, “きゃ、きゅ、きょ”. At the second row. “しゃ、しゅ、しょ”. At the second table, first row is “ぎゃ、ぎゅ、ぎょ”. Read each letter. After reading, listen to the audio and check the answer. Great! You have finished all Yōon Hiragana letters!